Jet Vac was known as the greatest ace in his homeland. Like all sky barons, he was given magical wings as a child. But when his home was attacked, he chose to give his wings to a mother who was trying to save her children by flying to safety. This brave and unselfish act caught the attention of Master Eon, who seeked out Jet Vac in order to give him a gift: a powerful vacuum device that restored his ability to fly! Now Jet Vac fights alongside the Skylanders. Jet Vac’s Skylander element is air. There are many different Jet Vac Figures out there. Firstly, there’s the Lightcore Jet Vac. There is also a Legendary Jet Vac, and a very rare Blizzard Jet Vac. Jet Vac is also included in the Skylander: Battlegrounds Starter Pack for your iPhone/iPad/iPod Touch. Bring your Skylanders to life! Frozen in our world. Alive in Theirs. For Generations, the Skylanders have used their magical powers and weapons to protect Skylands. But now, an evil tyrant has frozen them and banished them to Earth. Only you can put them on the Portal of Power and bring them to life to save Skylands forever. 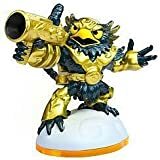 Each Skylander has their own unique powers and abilities to enhance your game play experience and save Skylands. Bring your Skylanders to life by placing them on the Portal Of Power. The Skylanders figures remember their in-game experiences and upgrades. Each character has unique abilities and powers, play more and unlock special moves and superpowers. Skylanders Interaction Figures work with the Skylanders Spyro's Adventure video game and on the web in Skylanders Spyro's Universe. See Jet Vac in Action!